Bosch dishwasher displaying an error code? Bosch dishwashers have built in diagnostic systems. If your dishwasher finds, sees, or detects a fault or error in the system, it will show an error or fault code. The error code will display where the usual numbers are on the display screen. When an error code is displayed, your dishwasher is telling you a specific fault. The error code will tell you which parts on your Bosch dishwasher to replace or check. 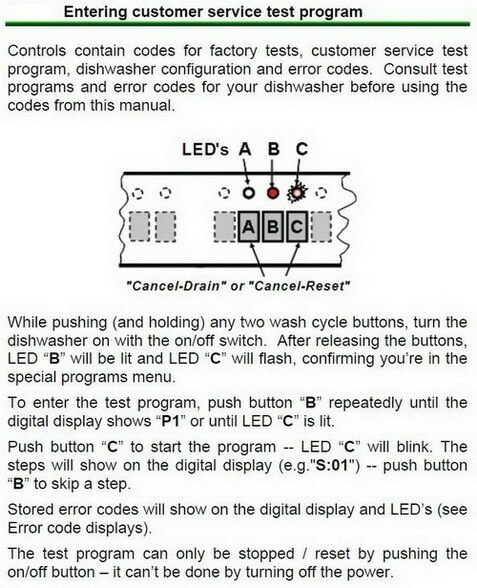 You can also Search YouTube for Bosch Dishwasher Error Codes or get advice from your Bosch dishwasher owners manual when your Bosch Dishwasher Is Displaying An Error Code. 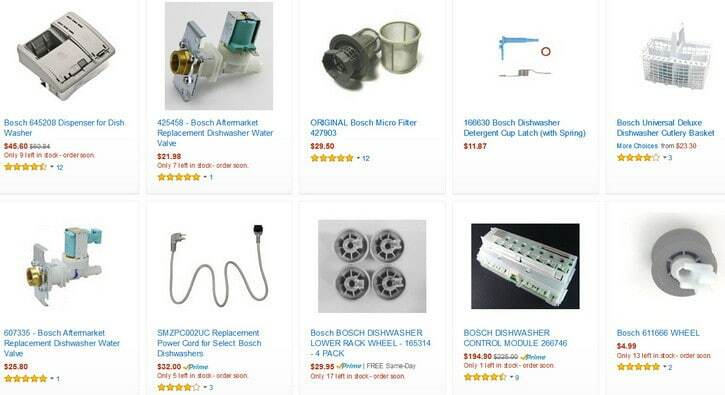 NOTE: Before ordering any parts from the ones listed below, check that the parts will fit with your model number Bosch dishwasher. Repair or Check: Check the water fill level. If water level is low then the heater will not turn on. If water level is correct then the flow switch or the heater could be bad. A heating failure means accessing the heater and requires removing the dishwasher tub. Fault Condition: No water in dishwasher or not sensing water. Repair or Check: Tilt dishwasher back and the error code should disappear. While you tilt it press off button to clear. Stand it back to normal turn back on and dishwasher should run normally. Repair or Check: Accessing the sensor requires removing the dishwasher tub. Repair or Check: Check for a blocked pump, a dirty filter, or grease build up. Repair or Check: Circulation pump or main control issue. Repair or Check: Remove and clean filter or unblock pump impeller. Repair or Check: If the water supply cut-off valve on the dishwasher is completely open but the dishwasher will not fill with water then shut off the water supply and unplug the dishwasher. Remove the water fill line and check to see if the water inlet screen valve is plugged up. 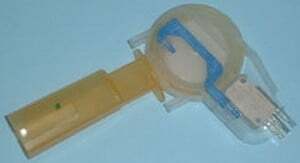 If so then replace the water valve. Cleaning the screen can make the issue worse so always replace if the screen is clogged. The valve can get stuck open from gunk and therefore flood or overfill. Repair or Check: Remove the dishwasher from power by unplugging it. 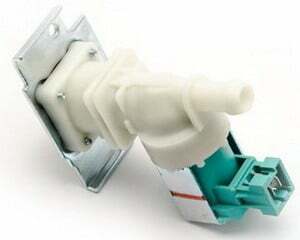 If the dishwasher keeps filling with water even after unplugged then replace the water inlet valve complete assembly. Check float switch. 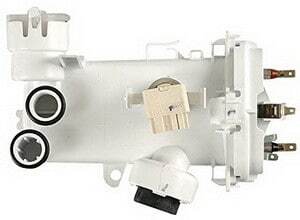 Repair or Check: Aqua sensor detects if the water is clean or dirty inside the dishwasher. Accessing the sensor requires removing the dishwasher tub. Repair or Check: Drain blocked – Check tray under machine for water leaks and If dry lift the rubber flap at the back of the sump molding under the filters and clean. Repair or Check: Unplug dishwasher for 3 minutes to reset. Do you know of other Bosch Dishwasher error codes? Do you have an error code on your Bosch dishwasher and need help finding and fixing the problem? Please leave a comment or question below. SHX43C05UC/38 dishwasher; Did diagnostic and “delicate/ econo” light flashes and refill rinse agent stays lit. Thought heating element, but read control panel might also be issue. Bosch dishwasher is running and going thru some basic functions. However a continuous beep is sounding off. Digital window displays the numbers 2:14. Display shows basic picture of diswasher door opening and closing along with the word “end”. Hi I have a Bosch dishwasher SHE3ARF6UC/21. The error code is h:03; later it changed to how. 1. What does this mean ? 2. What do you suggest to fix it? 3. Why do you people hide this information? I have dishwasher model SHX53T55UC/02. It was working well till yesterday, but today when I pushed On button I t shows 0:49 instead of showing washing time. It doesn’t work. Please help me. Hi I have a Bosch dishwasher sms25aw00g. The error code is h:18. What does it mean ? I have a Bosch F6UC/22 dishwasher. It’s showing an h:07 error code. It will not work at all. I am having issues finding a service tech in my area to come to my home to repair. What does this error code mean? and is it a part I would be able to replace myself? I used to work for a refrigeration manufacturer assisting in the tech dept. so I am some what knowledgeable for repairs. Please advise or point me in the right direction. I am unable to locate a service manual for this product. It was not located any where on the unit. Any help would be greatly appreciated. Have changed the control board and reset with both lights flashing. Turned it in and it’s displaying 188 and sounding like it’s qorking but no water or spinning? Check Water and Rinse Aid flashing together on Bosch SM6P1B dishwasher. What does this mean please? We have Dishwasher Model SHE23R52UC/64. We just replaced the facia board. The lights come on but buttons don’t work. Display is showing C5. Now what? anything about it on your site. I have Bosch dishwasher super smu53m72sk/93 which will not heat water. It is now showing error code E31, Can you offer any advice please? My Bosch dishwasher is showing code h05. I have a six year old SM6P1B Bosch dishwasher which will not drain, and therefore no programme will go for more than two minutes before stopping. Outlet hose is clear, filters cleaned and pump cover removed and no residue there either. It is now showing error code E14, which does not appear in the list. Can you offer any advice please? Hi, I have a SME69U00EU/55 Bosch dishwasher. This has a display but it is showing nothing on it. The red led beside the water tap symbol and the red led beside the ‘rinser’ symbols keep flashing on and off. Otherwise it is dead! Any ideas? Thanks. After returning from vacation our dishwasher displays h:02 and won’t start. Have checked and cleaned the filter and poured about a quart of water into the bottom. After each try I pushed the start button and nothing happens. Also the red light to “replace rinse aid” is on. Can I try to reset things? What does H:22 mean on a Bosch Dishwasher? I have a bosch dishwasher model sms69l with digital display but there are no error codes but the rinse aid and check water lights flash and the display does not light up. Any ideas what problem might be as water appears to drain ok as never had any water left in bottom of washer. BOSCH Dishwasher S16p1b stopped emptying the water with e15 error. Now it just trips the MCB when switched on. I have just switched my Bosch dishwasher on and pressed the setting I needed and it came up CL12. I have never seen this before, can you help please? My Bosch dishwasher is showing a h11 code. From what I am reading, the h means a heating issue. What does the 11 mean? It’s the only code its showing in diagnostic mode but the water is not heating either. My Bosch dishwasher had the code h50. Has anyone heard of error code E35. Have searched everywhere I could think of. Bosch dishwasher not working and showing E27 code. Can anyone help. The Bosch dishwasher E27 code is not listed in the database. The manual says to call a tech. Call Bosch and they can help you. We think this is a door lock issue but not 100% sure…. Bosch will know more. Please let us know what they tell you. 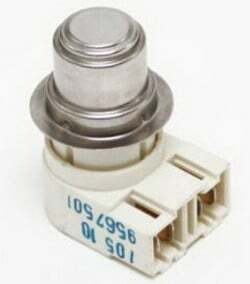 Had Error E9 on Bosch and technicians fixed by replacing thermostat and heating element. Now it shows E11 error after wash cycle. And dishes seem to be wet at the end of cycle. Better then with error code E9 but still not like when new. Pretty new machine but Bosch refusing to cover any repairs as I live more than 100 miles away from a certified Bosch technician. They just installed my bosch dishwasher and it display and E19 error. How am you fix that? Bosch Dishwasher with E19 error code means there is an issue with the control board. If it is a new dishwasher, call the company you purchased from and let them know. If you will have to repair yourself, a control board can be found online for around 100 US dollars. I have Bosch dishwasher model SHE53TF6US/01. Fault error code is 9. What causes the 9 error code? I have a Bosch dishwasher Model SHE3ARF6UC/14. I bought it used, installed it and it worked fine for about a month then threw error code E20 and would not plug the water sitting in the dishwasher. If I let it sit awhile I was able to get to the rinse and hold cycle and it would drain. I took it to an appliance repair shop and they replaced the complete pump and motor, I brought it home, hooked it up and it worked for 2 batches of dishes before giving the E20 code again. When I installed it I used new drain hose and have checked that it is not plugged. I plan to take it back to the repair shop but thought that I would see if you can recommend anything I can do myself to get this thing to work. 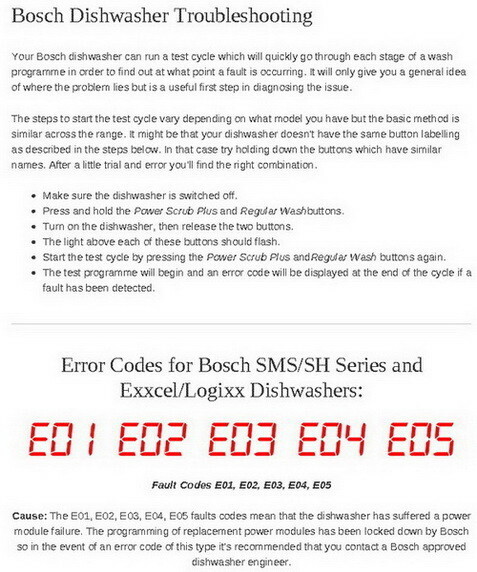 Bosch Dishwasher Fault Code E20 = Electrical short or break. 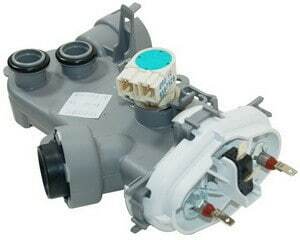 There is a short causing incorrect resistance in winding of the circulation pump or the motor. If you had the pump replaced, it may be a wiring issue elsewhere or to the motor. I have a BOSCH DISHWASHER SHE53TF5UC/02 that is throwing the E09 error code. Is that the same as a E9 code? If different what can I do to resolve this issue? Bosch Dishwasher Fault Code E09 = Water heating problem. Most likely heating element issue. I had the same E09 showing on a Bosch Silence Plus. I looked up the code on the internet and saw that it could be the heating element, as DIY Project Help Tips suggests below, but after letting it drain the machine works again without issue until it needs to drain again, then it shows E09 and has water in the bottom. It seems this E09 IS actually a drainage issue. I have a Bosch SHE58C05UC/50 and I wanted to try and run the diagnostic. Do you happen to have the diagnostic procedure for my model? My unit runs, fills the bottom and drains but doesn’t spray the dishes. Goes through an entire wash cycle and not a drop of water goes through the spray arms. I replaced the water inlet assembly but that didn’t solve it. This page may assist you in finding out why your Bosch will not spray correctly. 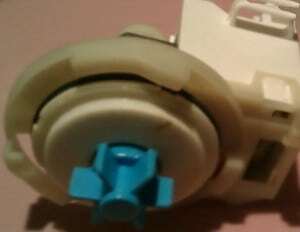 Bosch Dishwasher SHE58C05UC/50 Troubleshooting & Repair Help. I will try to replace the circulation pump also and report back. My Bosch dishwasher is flashing an H12, any idea what to do with this code? Possible problem with heating element or thermostat or wiring problem. I have a Bosch dishwasher and it has a h24 error message. I’ve tried doing what the instructions say and it’s not working. My dishwasher is Siemens SN25N881EU. It is error E19, my husband replace 0660 and 0404 part then water button flashes. Can you show me How fix this problem? I have a Bosch Dishwasher Model Number SMS50T06GB, I have an error code e15 on it. As per the comments I have tilted 45 degrees, left switched of for a week and still the same when you turn on, error code e15. Any further help with this would be much appreciated. Bosch Dishwasher E15 error means water has overflowed into the base pan below the dishwasher. The Bosch dishwasher is now in flood mode. This can be caused by the drain pump having blockage, also it can be from too much detergent and therefore extra SUDS. If the Bosch drains it out but doesn’t wash or refill with water, you have water left in the base pan. Basically it senses that there is water in the base pan and keeps showing the E15 error. Clean the water out with a shop-vac or similar and get it 100% dry. Once completely dry, the Bosch dishwasher should not show the E15 error again. If it still shows E15, this means a sensor may be bad (overflow sensor) or there is still water in the base pan. Jeg har fejlkode E:19 på min opvaskemaskine? Bosch opvaskemaskine fejlkode E19 er ikke opført i databasen … Prøv at tage stikket opvaskemaskinen i 10 minutter og se, om det kan nulstille den. I’m getting and E17 error message on my bosh dishwasher. There is nothing obviously wrong with it. I cleaned the filters even though they were not that dirty. There was only about a cup of water in the filter section. There are no blockages in the rotating arms. The dishwasher runs for about 2 minutes at the start of a program, then goes directly to the last minute of the program (showing 0:01 on the timer). It drains itself, then puts up the error message E17. My Siemens dishwasher SR657080GB/17 was displaying E25 but that has stopped and it is only displaying 1 minute. Is the Siemens dishwasher is showing error E25, this means the pump impeller may be blocked or jammed up or the drain hose is blocked. Can you hear the motor/pump running? Was the dishwasher draining properly? Check both, clean out if needed, and reassemble. If the error code comes back after cleaning out the pump and drain hose, try unplugging the dishwasher for 24 hours or so to reset the board. BOSCH Thanks! You gave me good advice for E15! I have an E19 error on Bosch dishwasher. Second time with this error. We often do short washes and I think this may cause issues as maybe machine does not get hot enough..
Last time we mopped up the water in the bottom of machine and checked filter (no debris as we rinse plates prior to washing). Left machine overnight and it worked following morning. This time same issue with water, we have done the same thing but so far error has not cleared. I don’t want to call a technician for a bit of grease on a sensor or something like that. Machine is only 4 months old. I am just trying the test cycle and I got E1. Please can you help? 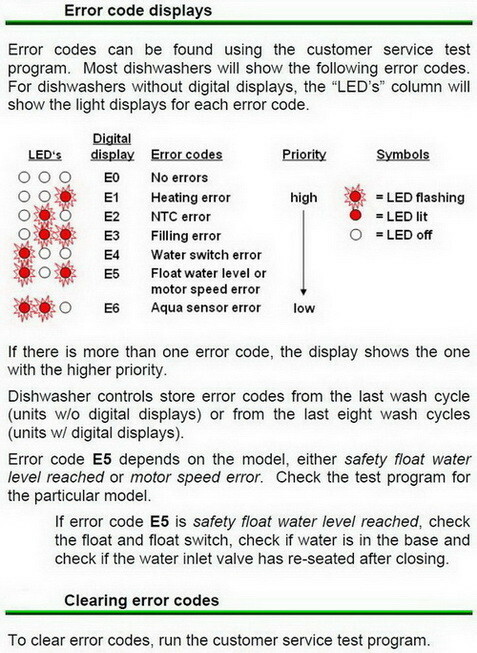 Bosch Dishwasher error code E01 means the water will not enter the dishwasher as fast as it should. Be sure you get good water pressure to the dishwasher. If you have good water pressure, the dishwasher water fill valve may be clogged or faulty. 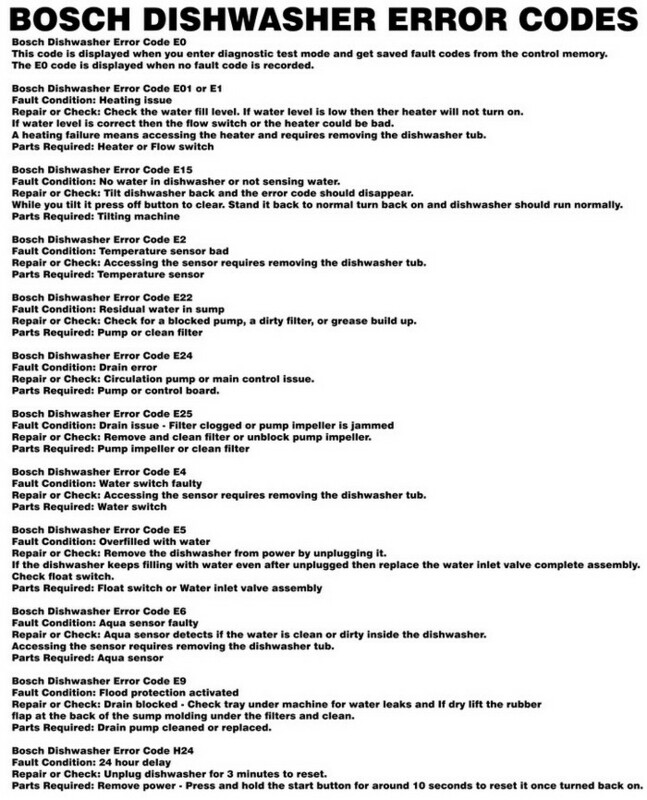 Bosch Dishwasher error code E1 means that the water is not heating as required. Bosch dishwasher error code E19. Have searched everywhere and can’t find anything on this code. Bosch Manual says = Seek technician if displayed. Have you tried to reset the dishwasher by unplugging it from power for 10 minutes? When the E19 error code is displayed, what exactly happens? Does the dishwasher run at all? At what point in the wash cycle did the E19 appear? I have the same issue with error code E19. I could say that reset power for a couple of days did not help at all. This code shows in 2-3 seconds after dishwasher turned on, and then it do not react to any buttons. With my unit it appears during night wash. Machine stops with dirty water and highlighting “Need salt”. Salt addition did not help also. It s a Bosch Dishwasher SPS53M22EU. Hi I have the issue with my dishwasher displaying e19 how did u get yours fixed? I am getting an error code E31 on my Bosch Dishwasher model SMV 69 T10 with zeolite dryer. Machine doesn’t heat water and all plates are still wet. Service person disassemled dishwasher, checked and said that heater, pump and main controller are OK, but (maybe? -he wasn’t sure) there is a water leakage somewhere inside and electronics blocks both water heating and air dryer. He suggested replace assembly for 400 euro. I’m really surprised with such approach and price. Is there any other way to help overcome E31 error? Bosch E31 is heat pump issue. If many parts were replaced and the error E31 keeps coming back, then the heat pump is most likely the issue. The pump may be leaking and causing the water to drip down into the bottom. Also in my bosh dishwater (mod. smv69u30eu) i’m getting the e31 error. Same problem. At the end plates are still wet and the machines doesn’t heat water. The heat pump were replaced by service person, but the problems still remains. Is there any other way to help overcome E31 error? It will not dry, the water also does not heat up, wonder what is the problem on the Bosch dishwasher model no SMS69EU38/50 bought in Jan 2013. Bosch Australia did not honour the international warranty of five years. I have a Bosch dishwasher model SGI55M05AU, the dishwasher operates but no longer heats up the water and the wash cycles are shorter. No error messages come up during a cycle but I get an E6 error during the self test. Is this a faulty aqua sensor or does it need a whole heater assembly. I am getting an error code E31 on my Bosch Dishwasher. What does this mean? Can you please give us the model number of your Bosch Dishwasher that is getting the E31 error code? My dishwasher model number is SMU53M72SK/93. The wash seems to finish, but the dishes are left wet, and the cycle ends with error E31. I read on an Italian support and repair site that I have to “check and possibly replace the heat pump”. I am not directly responsible for the machine, as it belongs to my landlord, I only allowed to perform standard maintenance and clean up, so I need to figure out whether or not I need a technician. Bosch Dishwasher Error E31 does indicate a Heat Pump Issue. You may just have a faulty connection on the heat pump. Check to see if the connection is secure. If so, the pump may be faulty and needs to be replaced. You can test it with a meter if willing. Check it, then let your landlord know if you suspect the pump needs replacing, then a tech can be called if needed. E31 means problem with Zeolite unit – some water could get into it. Exchange the zeolite heater and zeolite container. Inlet valve / Aquastop letting by appliance tilted backwards. Clean out the strainer at the bottom of the dishwasher. Check for any chunks of wax that might have gotten anywhere else and remove by hand. Then run the dishwasher with HOT water and ammonia… as ammonia that will cut through the wax. Do this multiple times without any dishes in the dishwasher and eventually the wax in the dishwasher will be gone. You may have to run the dishwasher 10 to 15 times with only HOT water and ammonia to fully remove the wax. NOTE: Do not add dishwashing detergent to the dishwasher when cleaning with HOT water and ammonia to remove wax. My Bosch dishwasher E-Nr. SMS50E88EU/59 shows red light against Tap symbol after 1 min into start program and the time display stays there. If I open the door and close it, the time display jumps to 0.01 and shows error E 18. Please advise if this error can be fixed by myself. My SMU50E65AU has a flashing display. Manual says blocked door or similar but of course there’s nothing in the way. When I press the on button the 2H shows up on wash but no water enters the unit ?. Should I fill the bottom section with water ? I think the unit needs to be reset, no reset button, not sure how to do this. Older unit,had a plumber in yesterday to unclog my kitchen sinks next to the washer but he never touched the dishwasher. Your Bosch dishwasher with the code 2H error USUALLY means the main control needs replaced. The 2H means there is a heating issue. You can check the control board for burnt marks or bad/loose wiring. My recently purchased Bosch dishwasher displayed this message —- a water faucet icon followed by 3 zeros. Can you help with this issue? If you cancel the program (reset) and select a new one, what exactly happens when you try the machine on a new wash cycle? What is the model number of your Bosch Dishwasher? i found the model numbers on the manual: SGV68U53UC and SGX68U55UC. i have a load going now, will update you. Bosch dishwasher error code E:25. It drains and the impeller spins, but it does not complete a cycle. There is not no blockage in the drain. The E25 Error Code Fault is related to a drain fault it might happen intermittently or the code stays on all the time, this is normally due to debris blocking the pump or the filter is blocked or on occasions the waste pipe might be kinked, or the waste unit that the drain hose fits onto is blocked. Check this video to see how to clear and fix the E:25 Bosch Error Code. I have got code H18 on Bosch Dishwasher. Are you sure it is not E18 instead of H18? My Bosch dishwasher is displaying e24 error code, the pump is working fine. Does this mean it would be the control board? Should we just replace both? Please help. The Bosch dishwasher E24 error code means a drain error, this also can mean an issue with the circulation pump or main control board. Check the drain system and be sure the filter is not clogged. Also be sure the check valve is in place and operational. If all checks okay, replace the board. What about Bosch dishwasher error code e14? The Bosch Dishwasher e14 error code indicates a problem with a sensor. Unplug the dishwasher from power and check the wires going to the sensors. Be sure no wire harnesses are disconnected or damaged. If the wires check good, than you may need to replace the one of the aqua sensors. Bosch dishwasher error code e27?? Bosch Dishwasher error code E27 means there is a problem with the door lock. Unplug the machine for 5 minutes and try again. If the error code returns you will need to replace the door lock assembly. My Bosch Dishwasher Model SMS68M02AU isn’t working and it shows the code h:01. I have turned it off and unplugged it and retried to do a wash but it still comes up with h:01. Bosch Dishwasher Code H:01 means a 1 hour delay. To get it back to normal… Press the delay button repeatedly to get the display to h:00 and then press start. I am continuing to have error code E15 come up after washer off. My dishwasher is fixed into my cabinet work so cannot tilt. Is there another way to clear the code? If you cannot move the dishwasher… let the dishwasher just sit unused for a week or so and the water in the base pan will evaporate. You could put a fan near it to help evaporate the water. The Bosch dishwasher will need to be tilted at a 45 degree angle forward to clear it. I am getting an error code H04 on my Bosch Dishwasher. What does this mean? 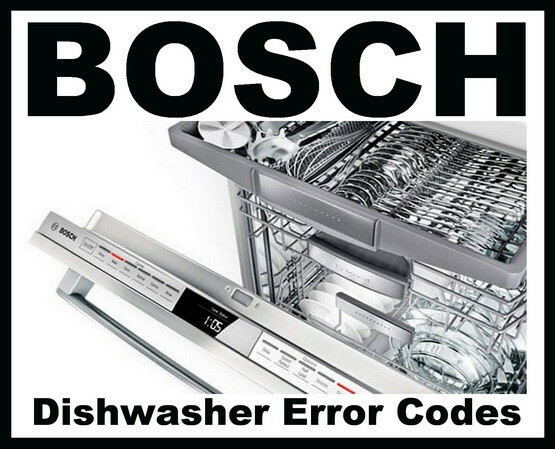 Bosch Dishwasher Error Code H04 = H04 is not considered an error code on Bosch Dishwashers. Someone may have pressed and held down two buttons when turning the dishwasher on. Unplug the dishwasher for 5 minutes and see if the display resets itself. If the H04 does not clear, you may need a new control board. Please advise what action to take for Bosch dishwasher Error Code E21. According to the manual Bosch Dishwasher error E21 = Check the pump to see if something preventing it from spinning. Check the hose from the dishwasher as it may be clogged. Great info but I would like to add few more error codes here i.e. Bosch Stainless dishwasher, model SHP65T55. I’ve looked through the other trouble code comments and don’t see any for H-11 and H-12?